MY THOUGHTS ON ASUU STRIKE, THE TEENAGE STOAWAY & GOVERNOR SUNTAI OF TARABA! You can't live in Nigeria and not follow the news, there was a time I would never read the news but now, I want to read it. I want to know what is happening within our country, I want to discuss it. I want us to engage one another. I intend to continue posting news stores that grab my attention, let us talk about it! My worry is this: the flight officials were reportedly informed that one smalley was seen walking towards the tyre of the plane oh, I would expect that the flight should have been stalled and proper investigation carried out, instead, the pilot still went ahead with the flight. 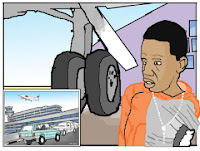 What if the boy was planting a bomb...see how porous security is at some Nigerian Airports? Now FAAN and ARIK are speaking big big english, no on wants to take the blame for this mishap! 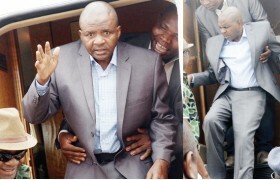 Did you guys read about Taraba state governor Danbaba Suntai that came back from the hospital abroad where he was receiving treatments for the past 10 months! Yes, he has been out of Nigeria for that long. Basically he had an accident 10 months ago when an aircraft he was piloting crashed. He is lucky to be alive. Coming back is not the problem, you should have seen the state in which this man was brought in. He could barely walk and was supported by his aides throughout, he could not talk, if he could he should have given a press speech. Why oh why did he come back when he OBVIOUSLY is not feeling well? To govern Taraba? How? I just imagine he is a puppet and the puppet masters are pulling the strings. Doesnt this remind you of the last days of Yar'Adua? sings in african china's voice...* Make una lead us well...no let this nation to fall inside well. Oh and are you following the ASUU strike?ASUU = Academic Staff Union of Universities. 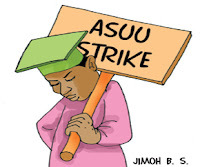 ASUU has been on strike for over a month and to be honest ehn, students don tire to stay house. I mean! One dude was complaining that he misses getting allawi from his dad cos since he's been home, no allowance. Isn't that enough reason for the strike to be called off? Not to mention all the girls wey go carry belle in this season because they are not in school. Proposed names for some of the babies they will bear are: Asuubukunmi, Asuumuyiwa, Assuseyifunmi... etc. LOL. Do you think this strike should go on? When two elephants fight, na the grass e dey affect. ASUU & Federal Government abeg you people should come to a reasonable conclusion to this madness! See why people are hustling to run to obodo oyinbo? Of course the strike should not continue, I still don't know why the government is stalling. As for the small boy, God saved him o, did he think he could cross the atlantic in the wheel space of an airplane? I laughed at the story of the boy, even though I know I shouldn't have. 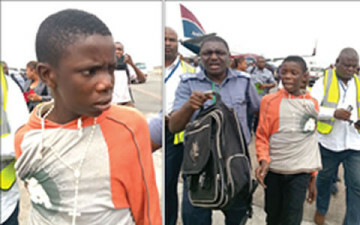 I don't know if the disappointment on his face is because he landed in Lagos or because he was caught. I can only imagine what was going through his head. LIKE! He would have hissed , na Nigeria I still dey???? Oya blog about the COZA pastor and Ese Walters... I'm itching to read your views. I like posts like this. Thrashing real Nigerian issues in a practical way. Please, keep these kinds of posts coming. Goes to show one should never underestimate kids. How did he learn about planes and how to travel safely? And the determination abi bravery? I wish him well anyway and pray he seeks a different goal. Like Myne said, if it had been truly a transatlantic flight, na frozen dead body dem for find. He would have died if that plane trule went to America... and oh, I heard he recently got a scholarship. We might as well try Asuun? No? Lol ok. *goes in the corner* The boy's story made me sad about our airport security and I am sure somewhere in the horizon poverty is to blame. As for Suntai, please I hope we wont have a repeat of the Yar'adua drama season 2 with new actors and cast. Plane tyre go soon turn to underbridge.